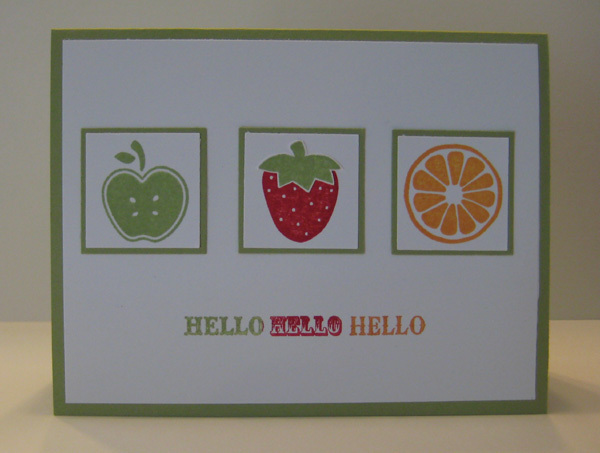 Here are my last two Tart and Tangy cards since they will be retiring tonight and we can shop from the new catalog tomorrow! 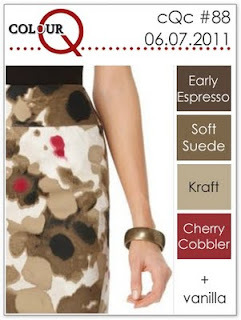 The first one features the new embossing powders in the mini catalog. 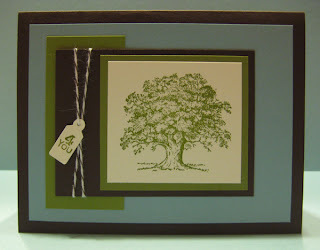 The second one is an oldie but a goodie that we did recently at Shanon's workshop. 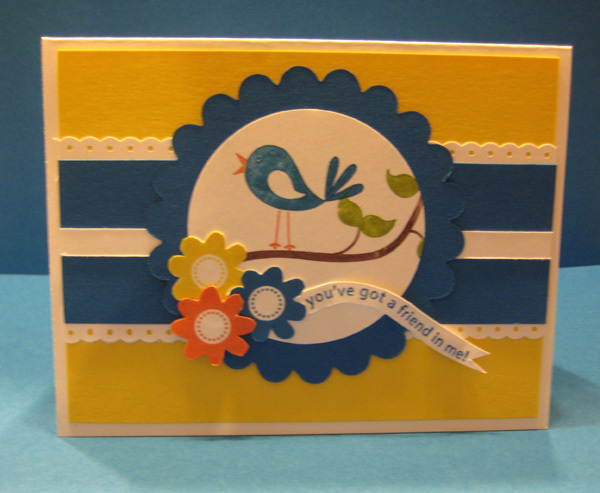 This is one of my favorite projects from last week's stamp club. I like this set a lot and may have to keep this one even though it's retiring. It just makes such cute cards! 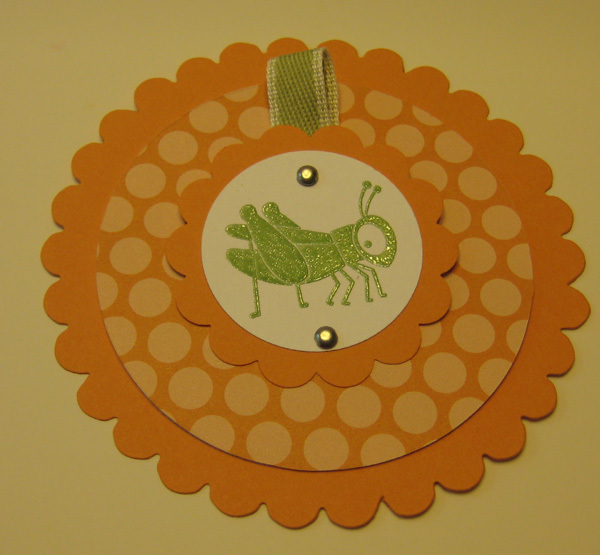 I used the Peach Parfait and Pear Pizzazz paper and cardstock but then embossed the grasshopper and greeting with our Wild Wasabi and Tangerine Tango embossing powder. 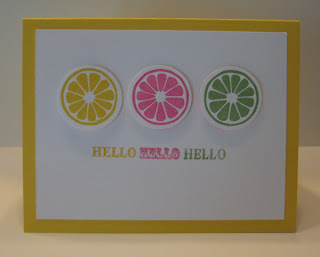 VersaMark and Stampin' Pastels are all you need to stamp this quick card. 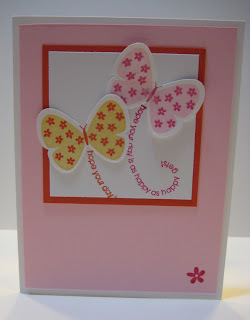 I stamped the flowers in the background with VersaMark and then stamped it on the Whisper White. With your pastels, apply color to the VersaMarked area and you can shade and color images with any of our 40 colors. 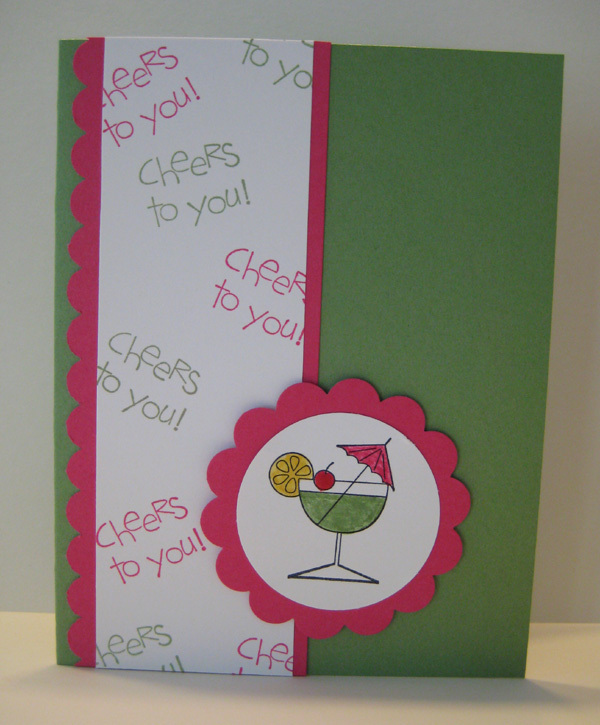 This card features a retiring stamp set and a fun technique. It's called Gradient Color or Color Gradation. There really isn't much technique to it, but it produces a cool effect. Simply apply color with a marker direct to stamp. Start with your lightest color and end with the darkest. It's kind of like creating your own rainbow ink pad. This set has been a good one for me. 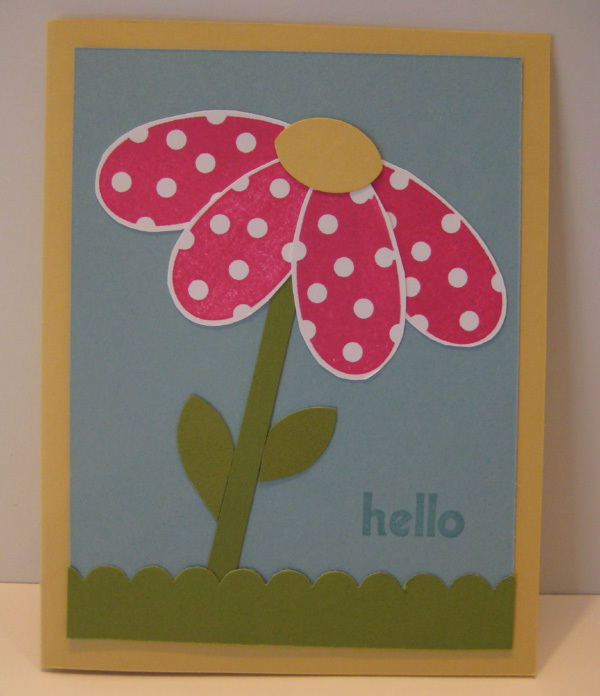 We have made many flowers over the years as well as faces and ladybugs. Talk about versatile! 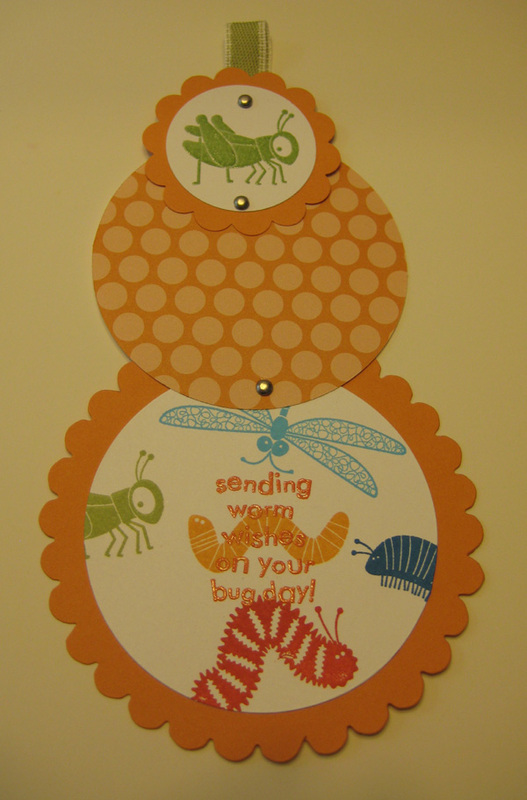 Here is the card we made at my Going, Going Gone Stamp-a-Stack. 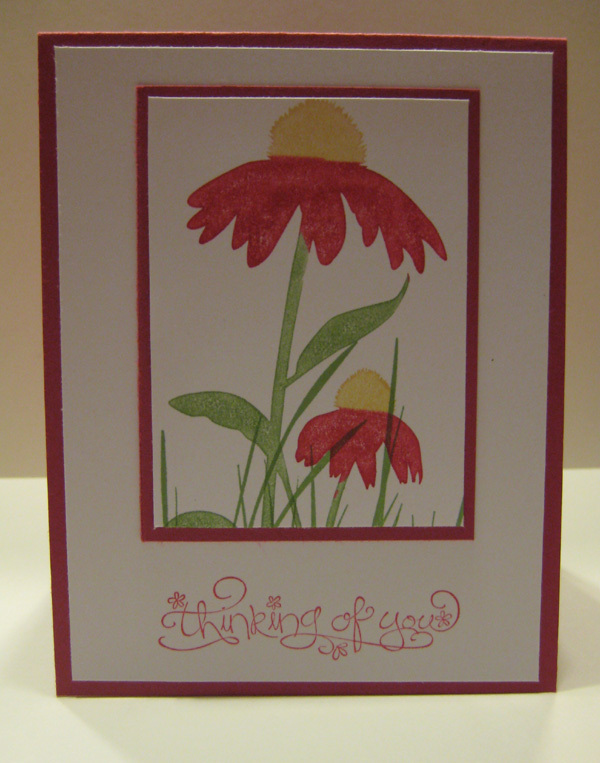 We have more rain forecasted for this afternoon so this sunny flower garden seems like the right card to post today. 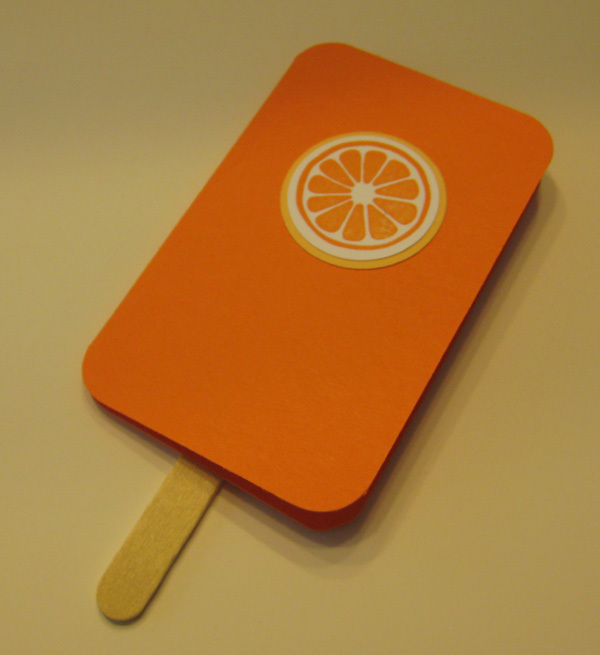 This is one of the projects we will be doing tonight at stamp club. There is nothing hard about it, but there is a lot of punching... 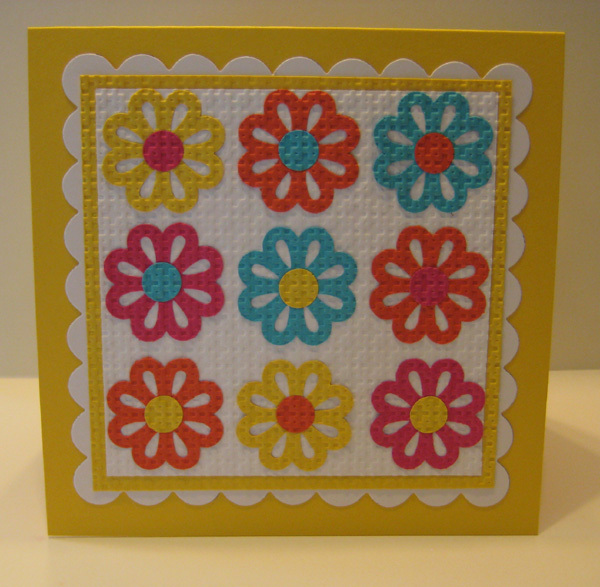 It is larger than a standard card in order to all for all of the flowers to fit. But as I was trying out different layers, I decided that extra Whisper White scallop square around it adds a lot and was worth the bigger size. Here's another take on the card I posted Wednesday. 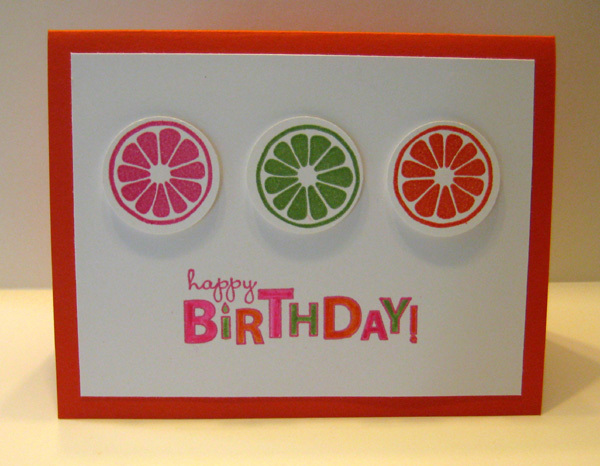 I just love how easily I can make a simple but cute card with Tart and Tangy! This is one of the cards we are doing this Friday night at my Going, Going, Gone Stamp-a-Stack. 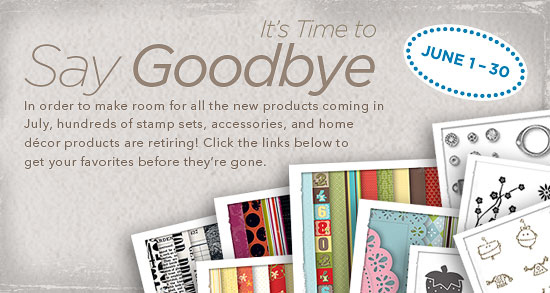 All of the cards we are making use retiring stamp sets. 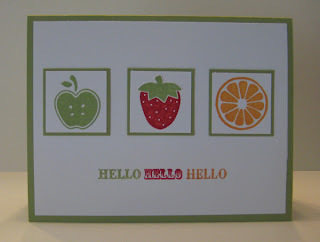 Tart and Tangy is one of my favorites, but I happen to know of several customers who really like this stamp set too! 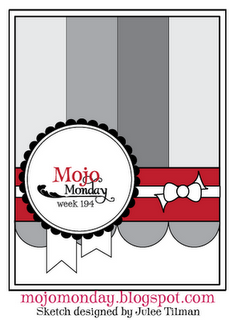 Here's my take this week on the Mojo Monday Challenge with another soon to be retired stamp set. Cheep Talk has been well loved and well used at my house! In January, I ordered my pocket calendar for my purse online. So when it came and was way too big, I was too late to get much of anything that would work. 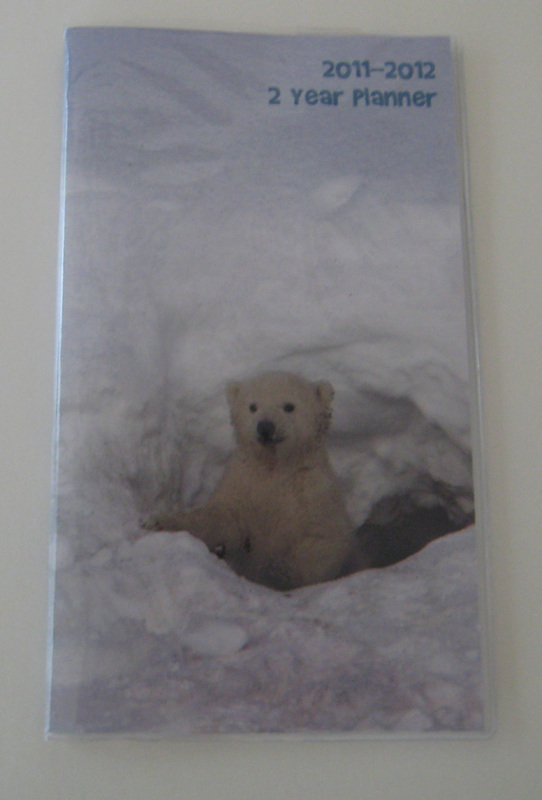 And because beggars can't be choosers, I wound up with this polar bear calendar for full price - - $1.99. I was just happy to find something, but was never too crazy about the look. Six months later I have finally done something about it. 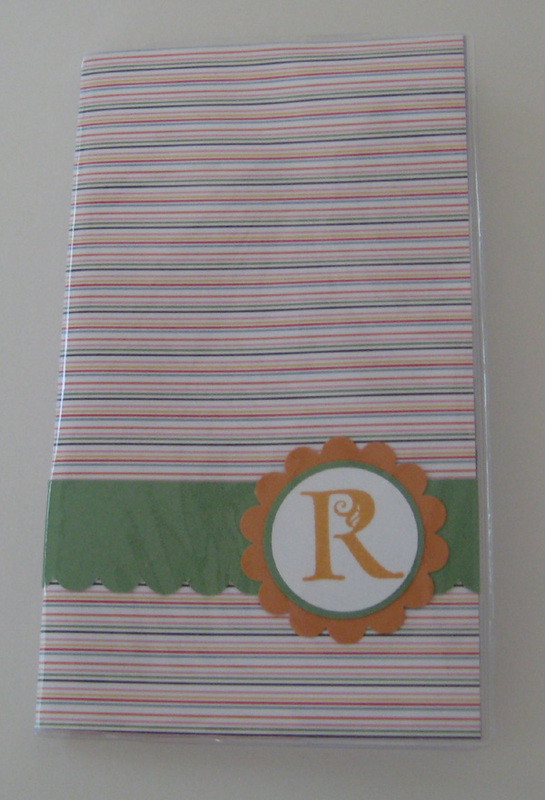 I used some of the new Designer Series Paper, Just Add Cake, and added a monogram. 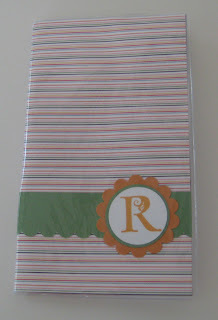 The plastic cover has made the stripes look a little dizzying in the picture, but in real life, it is just a simple pocket calendar that I am no longer embarrassed to pull out of my purse. I have been making an effort to stamp with my retiring stamp sets this month, and here is another one I will have to say goodbye to at the end of the month. It has a coordinating wheel, but I decided to keep it simple for this one. We'll be making this card tomorrow at Shanon's workshop. I went into my craft room to "clean" and wound up stamping this card. I was making a bigger mess so I decided to do another Mojo Monday Challenge and at least be productive. 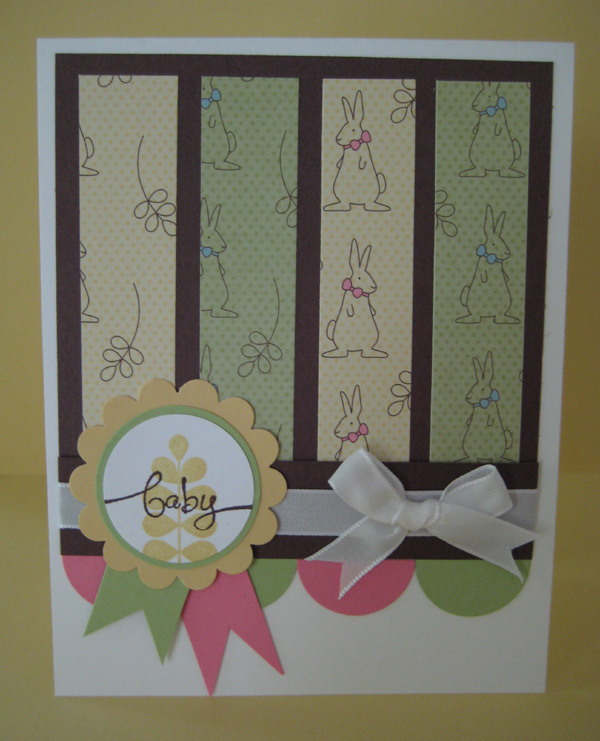 I used soon to be retiring Designer Series Paper, Nursery Suite Specialty. I inked just the word baby from the stamp set A Word for You, and I used the leaf from Funky Four. The retiring stamp set, So Cute, has a coordinating bunny in it that would have been perfect, but I am happy with the way the leaf worked out too. Last week I tried a sketch challenge and found the card went together pretty quickly, and I was happy with the results. So this week I decided to try a color challenge from Colour Q. I find colors hard to put together sometimes and don't always venture far from my favorites so a challenge was just what I needed. I wanted to try to use one of my soon to be retired Stampin' Up! sets, and when I saw these colors, I knew which set would be just perfect. 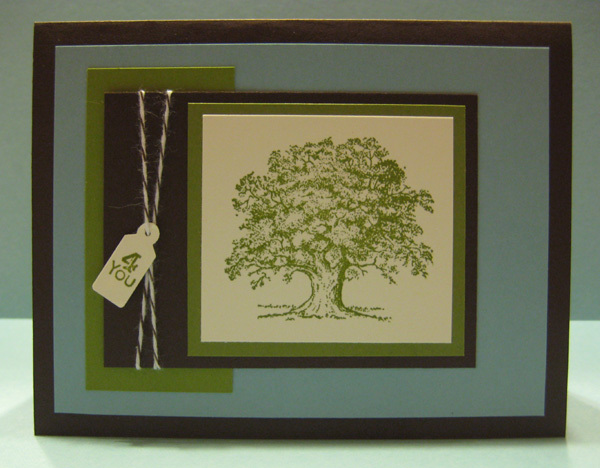 I am not as good at making manly cards... partly because the stamp sets I own tend not to be too manly, so Lovely as a Tree is my ol' standby. 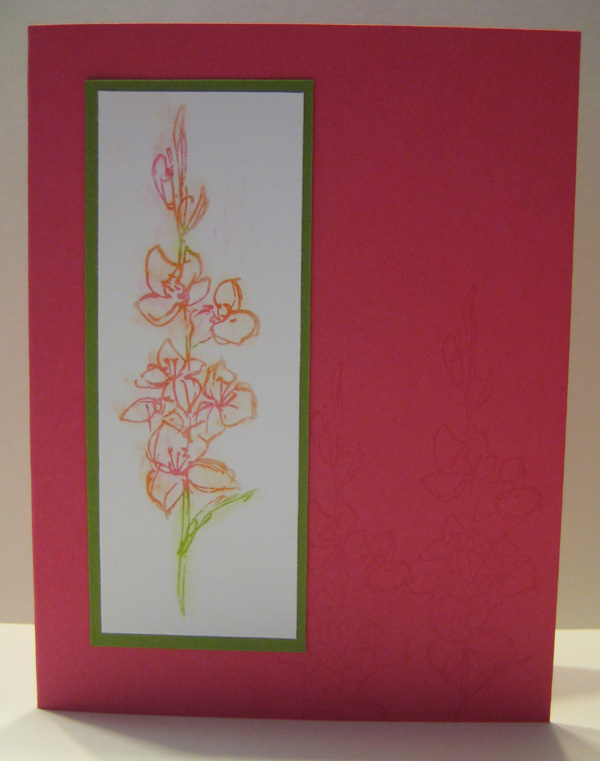 At my stamp-a-stacks this weekend, I promised all occasion cards. With Father's Day coming, this one could be used for Father's Day or any other manly occasion. (One of mine may go to my principal on Bosses' Day.) 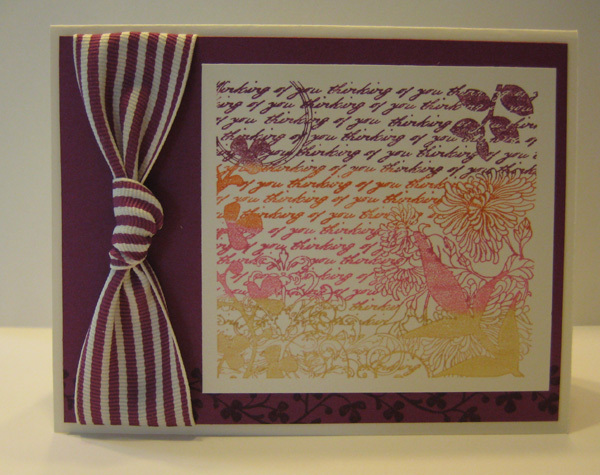 I was able to jazz it up with the baker's twine since ribbons are less welcome on a man's card. I seem to be on a Flight of the Butterfly kick lately. Actually this card was one I considered for club last month but decided against it. It uses two of the three new colors of embossing powder from the summer mini catalog, but it just didn't pop as much as I wanted it to. The butterflies are punched and "flying" off the page and the flowers are embossed, so still a cute card, but it didn't have the wow factor with the embossing powder I was looking for. Stay tuned - I plan to use the embossing powder this month! I am addicted to cooking blogs. I bookmark like crazy but don't often actually make the things I have marked for one reason or another. So for my treat tonight, I decided I would choose something from my recent blog surfing and bookmarking session. The bonus was that I had all the ingredients I needed in my cabinet already. 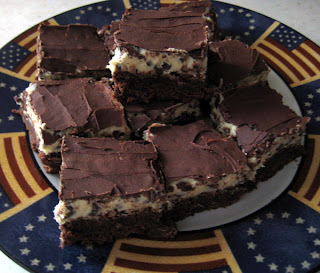 The chocolate treats tend to jump out at me and what's not to love about brownies and cookie dough together? My recipe came from Cookies and Cups and turned out great if I do say so myself. I have always liked this stamp set, and lucky for me it was one that was in our convention bags a few years ago.﻿ So Stampin' Up! saved me from buying this one and freed me up to buy a different set (or two). The greeting at the bottom is from the Summer Mini Catalog and is the level 1 hostess set - Swirls and Curls Verses. 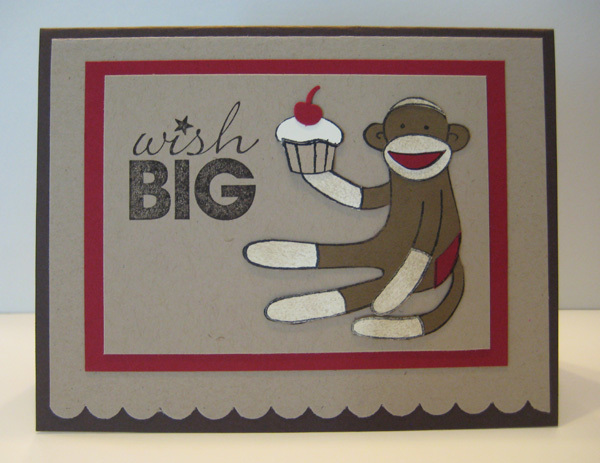 I made this for my stamp-a-stacks this weekend as an all purpose card. We have to make room for all the fun new stamp sets, accessories and surprises in the 2011-2012 Idea Book and Catalog that will be out July 1. As always, we have to say good-bye to some old favorites. Definitely Decorative items and the accessories are available only while supplies last, so if you see something you can't live without on that list, your best bet is to CLICK HERE! to order online right now.